Allison Albert grew up in Lancaster, Pennsylvania – a Mennonite stronghold known for meadow tea, farming, and lots of sewing in school. Naturally, this led her to become a forensic CPA by day and an amateur pet costumer by night. 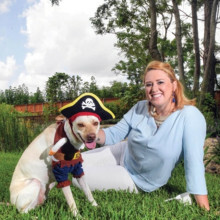 By 2015, Allison’s passion for spreadsheets waned in comparison to her love of pet costumes, and she turned her hobby into a viable business. Thus, Pet Krewe was born.